Fibble is puzzle game with stages heavily influenced by both pinball and miniature golf. The game tells the story of Fibble, a tiny alien creature who crashlands in a suburban yard. As the game proceeds, Fibble is reunited with his five crew-members: Byte, Vroom, Doc, Rango, and Klonk. Levels feature some combination of these characters, who allow Fibble to navigate levels in different ways. The goal of each level is to complete it in a single "flick." Once Fibble is launched, he uses both the terrain and his crewmates help to collect all the coins and stars en route to the goal. Gold, Silver, and Bronze medals are earned based on time, number of flicks, and coins/stars collected. Fibble allows players to share progress via facebook updates, and also includes microtransactions reminiscent of cheat codes. At the time of writing, it features 6 worlds totaling 47 stages. 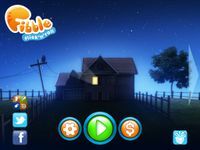 Fibble is the first iOS game released by famed developer Crytek.